GigGum is the fast, fuss-free and efficient way to generate smart links and landing pages for tour dates to increase ticket sales. No coding. No cost. Just great PR. GigGum makes smart links and generates landing pages for your upcoming tours. No technical IT skills required. Use the same link on various platforms, and GigGum will seamlessly redirect your fans to a landing page with ticket sales to your tour dates. A link and tour plan, ensures that users are always presented with the available tour dates and tickets. GigGum is easy to use - simply verify or import your data and we will create a landing page for promotional use. The system provides real-time insights and detailed analytics - a tool to manage various artists, and improve tour marketing and ticket sales, across multiple platforms and social media channels. 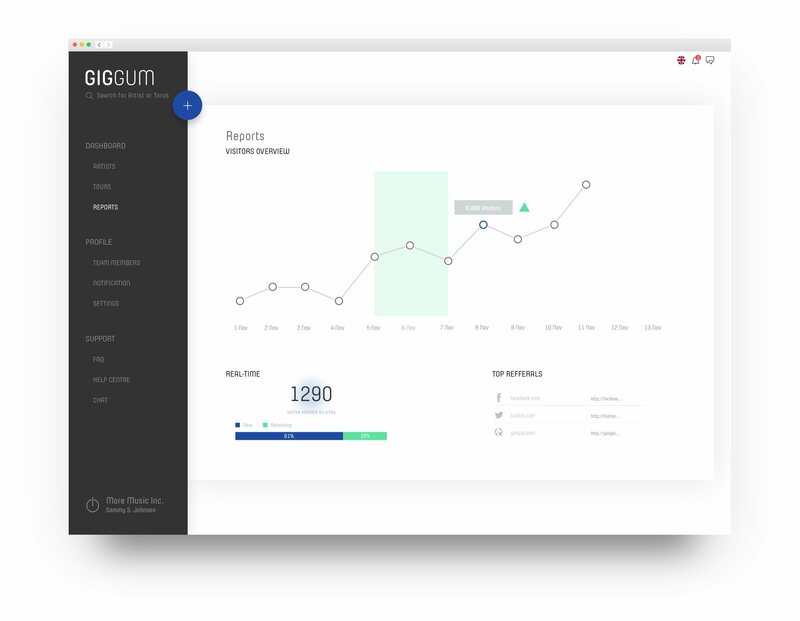 GigGum can track metrics and the dynamic interaction with the link, allowing you to optimize the marketing effort and conversion rates. 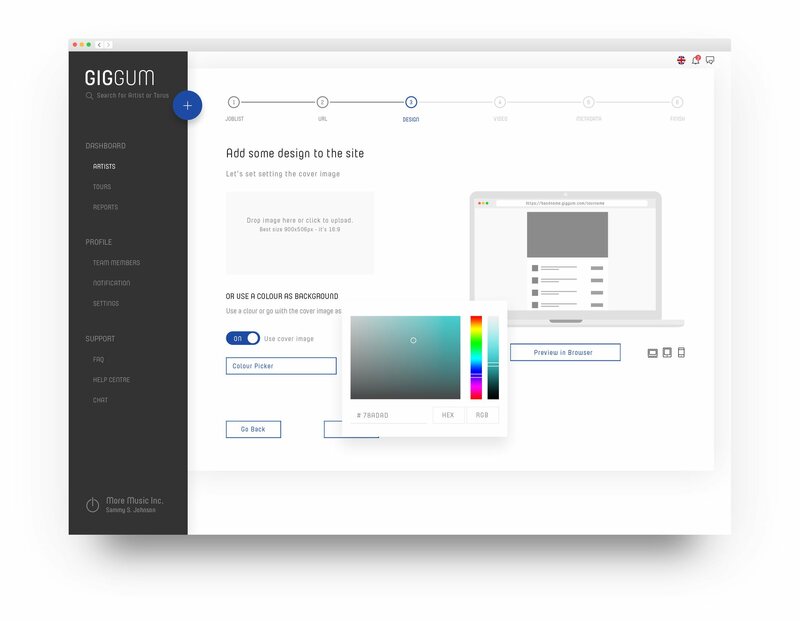 GigGum is easy to use - simply input your data and we will automatically create a landing page for promotional use. 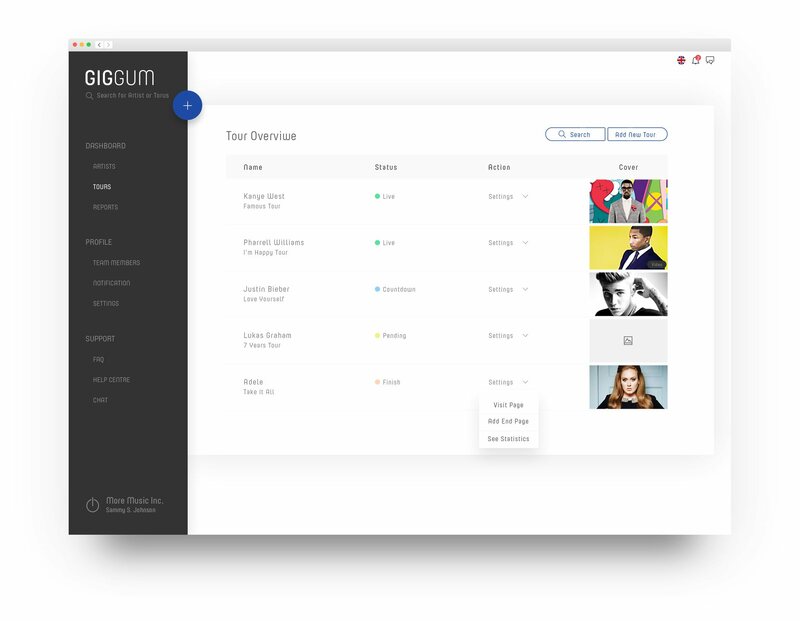 GigGum is a tool to manage various artists, and improve tour marketing and ticket sales, across multiple platforms and social media channels. GigGum is currently an invite-only service, but if you want to request an invite just go to the top. If you want to find out more about GigGum, you’re more than welcome to contact us. For more information or general inquiries please fill out the form. By accessing the website at https://www.giggum.com/, https://www.gig.to or any GigGum tour site, you are agreeing to be bound by these terms of service, all applicable laws and regulations, and agree that you are responsible for compliance with any applicable local laws. If you do not agree with any of these terms, you are prohibited from using or accessing this site or service. The materials contained in this website are protected by applicable copyright and trademark law. GigGum may make changes to any products or services offered on the site, or to the applicable prices for any such products or services, at any time, without notice. For instance, we may need to change these Terms if we come out with a new feature or for some other reason. Whenever we make changes to these Terms, the changes are effective immediately after we post such revised Terms (indicated by revising the date at the top of these Terms) or upon your acceptance if we provide a mechanism for your immediate acceptance of the revised Terms (such as a click-through confirmation or acceptance button). It is your responsibility to check GigGum for changes to these Terms. 5.1. The materials on GigGum's websites are provided on an 'as is' basis. GigGum makes no warranties, expressed or implied, and hereby disclaims and negates all other warranties including, without limitation, implied warranties or conditions of merchantability, or non-infringement of intellectual property or other violation of rights. 5.2. Further, GigGum does not warrant or make any representations concerning the accuracy, likely results, or reliability of the use of the materials on its website or otherwise relating to such materials or on any sites linked to this site. In no event shall GigGum or its suppliers be liable for any damages (including, without limitation, damages for loss of data or profit, or due to business interruption) arising out of the use or inability to use the materials on GigGum's websites, even if GigGum or a GigGum authorized representative has been notified orally or in writing of the possibility of such damage. Because some jurisdictions do not allow limitations on implied warranties, or limitations of liability for consequential or incidental damages, these limitations may not apply to you. The materials appearing on GigGum's websites could include technical, typographical, or photographic errors. GigGum does not warrant that any of the materials on its website are accurate, complete or current. GigGum may make changes to the materials contained on its website at any time without notice. However GigGum does not make any commitment to update the materials. GigGum has not reviewed all of the sites linked to its website and is not responsible for the contents of any such linked site. The inclusion of any link does not imply endorsement by GigGum of the site. Use of any such linked website is at the user's own risk. By subscribing to an email list on one of our sites you agree to receive email from us. The aim of our service is to keep fans and visitors updated about new tour dates or other related news. The emails and information is part of GigGum's system and will not be shared or sold to third parties for any purpose. Subscription to this service is not mandatory. GigGum allows you and other users to post, link and otherwise make available content. You are responsible for the content that you make available to the Service, including its legality, reliability, and appropriateness. These terms and conditions are governed by and construed in accordance with the laws of Denmark and you irrevocably submit to the exclusive jurisdiction of the courts in that location. - Device Information: We collect information about the computer you use to access our services, including the hardware model, and operating system and version. - Location Information: We may collect information about the location of your device each time you access or use one of our mobile applications or otherwise consent to the collection of this information. - Information Collected by Cookies and Other Tracking Technologies: We use various technologies to collect information, and this may include sending cookies to your computer. Cookies are small data files stored on your hard drive or in your device memory that helps us to improve our services and your experience, see which areas and features of our services are popular and count visits. We may also collect information using web beacons (also known as "tracking pixels"). Web beacons are electronic images that may be used in our services or emails and to track count visits or understand usage and campaign effectiveness. By accessing and using our services, you consent to the processing and transfer of your information in and to Denmark and other countries.